Hiya guys! Time for some more of the Polish Pick Up super release happening this weekend. Can you feel the hype? Haha. It's without a doubt my favorite time of the month. Every single maker just brings their very best to the table and wrecks our wallets. This afternoon I'm sharing swatches for Ever After Polish's October contribution to the Polish Pickup Collaboration. The theme this month is Monsters & Mythical Creatures, which is probably my favorite theme ever to be selected so far. I say that and watch me love the next five with all of my wallet, haha. I'm not complaining, but my wallet on the other hand... Anyway let's go ahead and get right into the swatches! Wolfsbane by Ever After Polish will be available for purchase through the Polish Pickup Shop October 6th at 11AM EST through October 9th. This full-size 13.5mL shade will retail for $10.50 each. If you're not familiar with the concept, the Polish Pickup offers a fun, interactive experience that allows you to submit theme ideas, vote for your favorite theme, and selectively purchase your favorite polishes every month. As I mentioned before, the theme that was voted for October was Monsters & Mythical Creatures! Wolfsbane is inspired by the werewolf from the Harry Potter universe. Wolfsbane can be described as a deep ultramarine blue holo with electric blue sparkle and a hint of purple. Hands down one of my favorites not only this month, but of all time with this brand. The formula has a very nice opacity, although it's not enough to be a one coater. Fantastic balanced consistency, not too thick or too thin. It's very smooth and layers like butter, seriously a dream to work with. Dries down to a high-shine on its own. I experienced no staining on removal to my nail beds or cuticles. Shown in two coats and sealed with a glossy topcoat. Overall another stunner from Ever After this month! Not going to try and hid my biased nature towards blue shades, but I think this one speaks for itself. And while it's up for a lot of competition in the blue department this month, I think the formula on this one is simply flawless! A total must-have for any collection and a fantastic way to try out this brand if you haven't had the chance. 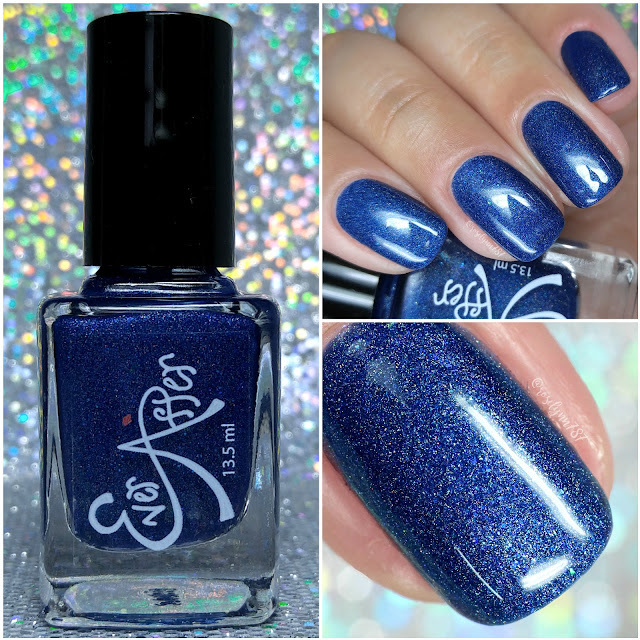 To recap, Wolfsbane by Ever After Polish will be available for purchase through the Polish Pickup Shop October 6th at 11AM EST through October 9th. This full-size 13.5mL shade will retail for $10.50 each.